People wonder what happens at the B and B in the off season. Well, the off season finally gives us total access to our rooms for updates, and Maria and I and “Fuzzy” (our handyman) have been working on those. Priorities for the winter of 2016/2017 have been framing in new doors for the downstairs apartment (Moose Manor) and kitchenette (The Bears Den) so that our guests have private access to their space. Also within The Bears Den kitchenette – we removed the upper part of a wall and replaced it with a bar and stools. This “opens up” the room and provides more opportunity for guests to enjoy the view when in the kitchen. Speaking of the kitchen – we added a sink, new countertop, fresh tile, fridge, microwave, toaster oven, shelving, and door. Outside, guests will find that we lengthened the deck walkway to go from the parking area right to both entry doors! Updates are expensive in Alaska, so that’s gonna be it for now! In the past two seasons we have added a new well, a new furnace, natural gas heat, hardwood floor in the main house living room, new carpet in the Blueberry Room, and plenty of new mattresses. Little by little, Maria stocks up on the food and cleaning supplies she needs for the busy summer season. And she cleans and organizes. Maria is also working diligently on renting spaces for the winter. The two cabin units, the moose manor, and the bears den all become 7-month rentals from October through April. Renting has been relatively easy to do in past years, but for a variety of reasons, it has become increasingly difficult this winter – which is a big challenge for Maria. I (Tim) call Maria “The Zumba Queen of the Kenai Peninsula” because in the midst of her busy life, she always has time to teach a half dozen classes a week to all ages of people in the Homer area. And she is also busy helping people with her DoTerra Oils (see our gift shop page). I am busy this winter working as a therapist at a private agency, and also at Minnesota Adult and Teen Challenge. I have been working many hours with our website developer to launch this new website in January of 2017. I am also planning for my busiest season yet as “adventure guide” for Majestic View Adventures! If you book dates with Maria to stay with us, Maria immediately forwards those bookings to my email – so expect to hear from me! Other than that, I have been relaxing in my ice shanty, and stocking up on whitefish and northern pike, which I spear on an area lake. If that weren’t enough, I have taught myself to catch bobcat this winter (two so far), and also spend much time taking care of my mother and her home, and visit my granddaughter and her family too! Maria is coming soon to visit me in Minnesota (for the holidays) and I am really excited about that. To wrap up – keep in mind that the main level of the house is still available for rentals in the winter. During the Christmas Holidays – Maria had several guests that were visiting Homer- come and stay with her, and at a super-duper reduced rate! 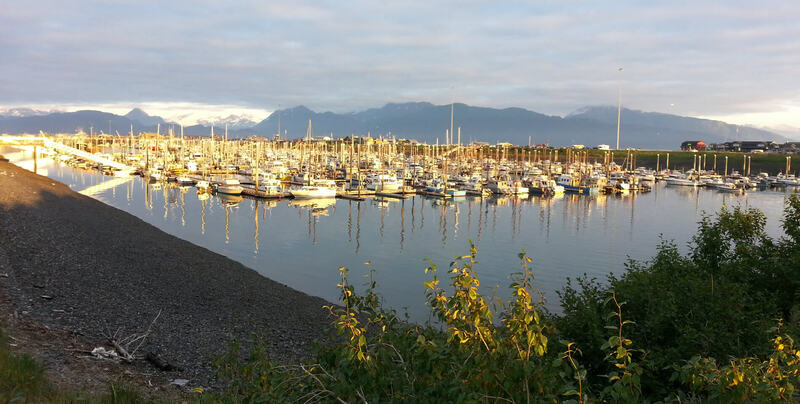 If you are going to be visiting Homer for any reason, or just need to get away for a couple of days – reach out to Maria and find out what she has available.